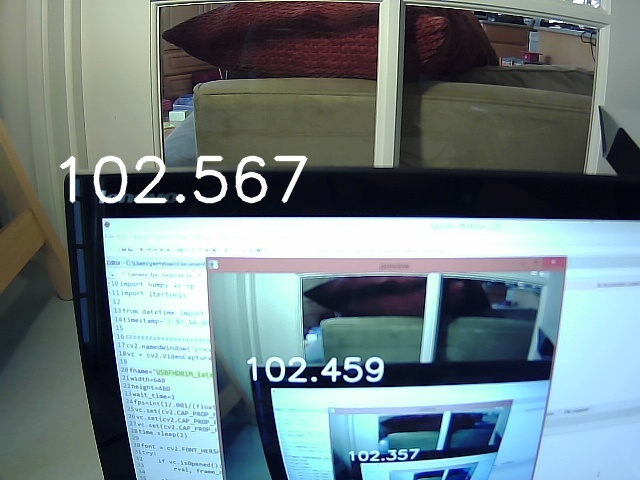 When trying to use a webcam in a computer vision application as part of a real-time control system, the latency is often just as important as the frame rate. Unfortunately, the latency for a webcam is often not specified, especially not for low-cost webcams. The difference between the time which is overlaid on the image (the largest type) and the time shown in the image from the webcam (the next largest) is the latency. 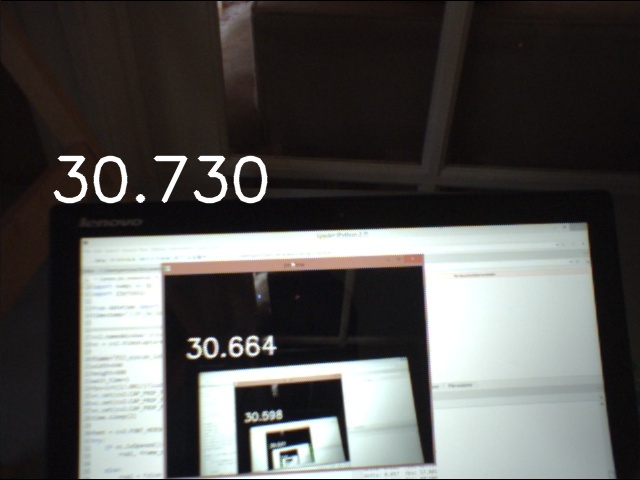 The Python / OpenCV2 code I used to capture these screenshots is up on Github. All cameras were set to capture at 640 x 480. The above cameras are all consumer grade cameras, costing about $45 for the ELP models, and only $5 (!) for the PS3 Eyecam. As a comparison point, $280 would get you the Slim-3U from Optitrack which is specifically designed for motion capture and has a 8.33ms latency. Let me know if you find any other sub-$100 cameras that perform better! This camera has a nice image quality, but the frame rate is slow and the latency was inconsistent. The lagginess of this camera is very evident upon first usage of the camera. This camera had good image quality, tolerable latency, and a 30fps rate. I tested the version with a 3.6mm lens, but the base camera model USBFHD01M is also available with a 170degree fisheye lens or 2.1mm lens. There is a nice review of this camera here. This is the camera that I ultimately chose for my computer vision project. The image quality from this camera was not that great though (you can see it’s image is more blurry than from the other two camera), so that is why I did not choose this camera for my project. It would be great for applications where there is fast motion and image quality is not as critical. 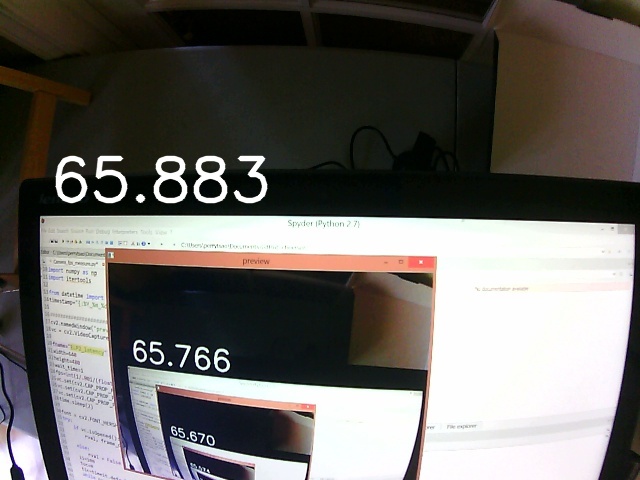 This is a project that measured latency using the same technique shown here using a Pi camera on a Raspberry pi. This is Young from ELP,thanks for your reviews. Here is new website of ELP, you can see and we had send email to you,please check it. I’m using this same ELP 2 MP on a Beaglebone Black with CV2 and v4l2capture in Python. Did you notice an issues with manual exposure? If I scan the exposures and take individual frames the exposure seems to go from long to short to long again. Hi Kenny – I don’t quite understand what you mean when you say you are scanning the exposures. From Joan Charmant’s post, the ELP 2 MP’s manual exposure values range from -1 to -13. I had been meaning to write a post about my experience with the ELP 2 MP’s manual and auto exposure. Thank you for your comment, it gave me the motivation to write the post! Check it out and let me know if that helps. Next Next post: What is an OTA DVR and why would I want one?